Welcome to the 16th episode of the DFB Podcast! In this episode we cover the latest Disney Food News; discuss AJ’s and Brad’s favorite table service options at three of the “other” Disney parks; answer a few listener questions; and reveal the answer to our Episode 15 trivia question and stump you with a new one! For this episode’s main segment, AJ and Brad chat about their favorite table options at the less-visited Disney parks (though this is probably no longer the case for California Adventure! ): Disney’s Hollywood Studios, Disney’s Animal Kingdom, and Disney’s California Adventure. Listen in to find out the answers to these great questions! Amy M.: Assuming that you have only one evening scheduled at Downtown Disney and you have dinner planned at Cooke’s of Dublin, which is the better option for dessert, sundae at Ghirardelli or brownie cream sandwich at Earl of Sandwich? Tara: What is your opinion on the best chocolate chip cookies on Disney property? Got a question? Send it to podcast@disneyfoodblog.com with “PODCAST” in the subject line. Name at least two new bi-coastal menu items, available at both Disneyland and Walt Disney World! Send your answer to trivia@disneyfoodblog.com to be entered to win a Disney Food Blog Dining Guide e-Book of your choice! 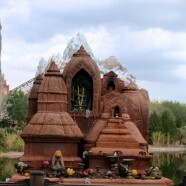 About the Picture: Animal Kingdom gets mysterious! Complete your DHS and DAK knowledge! Since we’ve discussed table service at Animal Kingdom and Hollywood Studios, all you need now is the companion snacks guide! The brand-new Animal Kingdom and Hollywood Studios mini guide to everything snacks are the answer! Get yours today! Or, opt to get our specially-priced bundle of all three snack guides, along with the 2013 DFB Guide to WDW Dining! Thanks for listening!! Please rate and review the podcast on iTunes, follow DFBPodcast on Twitter, and leave your comments below! I’m very disappointed by the fact that the Starbucks on Main Street doesn’t have the Disney baked goods, with a couple of exceptions. I don’t even like Starbucks coffee, so I don’t plan on going there. I missed you, DFB Podcast! Keep ’em coming! Finally got the chance to listen to this month’s podcast, and I totally agree with your picks. The last time we ate at Brown Derby, we felt the food was okay but overpriced, and the service was really slow and bad. I was surprised that you didn’t even mention Carthay Circle in the DCA segment, but not surprised that it wasn’t picked as a favorite. We ate there last November, and it was not a good experience. We arrived 20 minutes early for our reservation, and weren’t seated until 40 minutes later. There were a lot of other families waiting, and not enough seating available for them, so we had to stand for at least half that time. Once we were seated, the food was just fine, but, again, not quite worth the price. I would rather pay a little more to eat at Napa Rose and get higher quality food and better service. Also, they have an open kitchen, which is pretty noisy and completely at odds with the rest of the period decor. Overall, I would say that Disney seems to have trouble marrying the concept of the “fine dining” restaurant with the theme park experience. If I’m in the park, I don’t want to spend lots of time waiting through a leisurely meal. I want to be seated relatively quickly, eat dinner at a normal pace, and then get back out and go on rides and see shows. I would argue that Blue Bayou is the only one that really gets it right. Overall, another great show. We haven’t been to a Disney Park since January–a fairly ill-fated trip to WDW that so epically failed, we ended up with a 25% refund–but listening to you guys makes me eager to go back, just to eat! AJ – Instead of finding a way to affix your tray to railing, you should wear your tray. Then you can be handsfree anywhere. Like the guys selling drinks and popcorn at sporting events. I miss the DFB Podcast!! Will you be doing another installment soon? Please??? what happened to the podcasting?? i hope eveyone is okay. i miss listening to these podcast. ive always looked forward to them..
when are more podcast episodes coming? I love em.